Oguni in Kumamoto prefecture is a town famous for its beautiful nature, especially for its cedar forests. The great sights and the delicious local dishes, the charming shrines and the unique museums - all make Oguni an unforgettable place. Only in Oguni town in Kumamoto prefecture can you enjoy a full hot spring town experience like those found at Tsuetate Hot Springs, or the superb sights found at Nabegataki Falls. There are plenty of delicious foods and sights you must see at least once in your lifetime here too. Today, let's get a closer look at the delicious cuisine and sightseeing spots that you can only enjoy in Oguni, Kumamoto. One of the most popular treats found in Oguni is this, their Nomu Yogurt (drinkable yogurt; 160 yen). Made with milk from locally raised Jersey cows, this yogurt has a deep richness to it. Other dishes made with Oguni Jersey milk are also popular here. This is soft serve ice cream, made from Oguni Jersey milk. Having a similar richness of flavor as the yogurt, this ice cream is also quite refreshing. At several of the shops throughout Oguni you can find various flavors of this amazing soft cream, so why not make it a point to search for your favorite when you visit? Fans of sushi will be surprised to see this konnyaku jelly sushi, an unusual dish even in Japan. Though there are many different dishes made from konnyaku throughout Japan, using it in sushi is very, very rare. With cooked rice and green perilla (shiso) sandwiched inside thick slices of konnyaku, the flavors of this simple dish really work well together and make for a dish that everyone should try at least once. Thanks to the beautiful clear waters of Oguni, incredible soba noodles can also be enjoyed here. Possessing a spring to them, these fresh and delicately flavored noodles are another must. The variety of toppings and side dishes available with this soba varies by shop, but tempura made with Oguni vegetables is an excellent dish to start with. This is a solitary sakura tree beloved by the town. 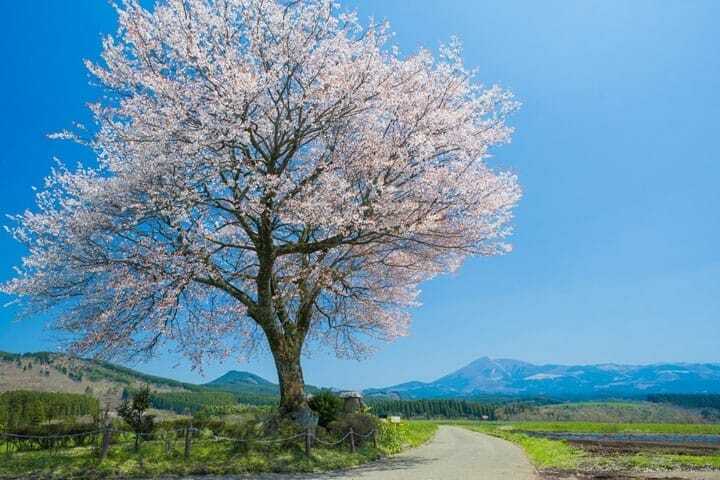 As it is a single tree situated on top of a mountain, the striking contrast between the brilliant green of the mountain and the delicate pink of the flowers in full bloom is a sight that many people seek out each spring. As it is an older tree, there are some branches that do not bloom any longer, but the people of the town do their absolute best to take care of their tree all year round. This is large ginkgo tree is known as Shimojo no Oicho. As it is the only tree of its kind in the town, it has been enshrined in Oguni. It goes without saying that the trunk is very thick, but the impressive spread of the branches and leaves can only be truly appreciated from looking upwards from the base - it's quite surprising! As this ginkgo tree is over 1000 years old, it has also been designated a natural national monument in Japan. The Amidasugi, or Amida cedar tree, is the largest great cedar in Kumamoto; believed to be roughly 1300 years old, this tree has also been designated a natural national monument in Japan. Its unusual name comes from its appearance. There are several large branches spreading out from the central trunk, and each branch is covered in multiple smaller twigs, giving it the appearance of being an infinite small forest on its own; the name Amida comes from Amida Buddha or Amitabha, also called the Buddha of Infinite Light. Here is the famous reverse view of the Nabedataki waterfall. With its continuously falling negative ion water, this waterfall is both impressive and beautiful, and has found popularity through its use in green tea commercials. This waterfall is part of and was formed by the Aso Caldera roughly 90,000 years ago during massive pyroclastic events that have left their mark on the Kumamoto region ever since. Here is Oguniryo Shrine, which has a rather unusual feature of its own. The numerous stone statues! With statues for every animal of the Chinese Zodiac, it wouldn't be an exaggeration to say that you can see all manner of stone creatures here at this shrine. Not only that but here you can also see the Mikami Cedar, a massive three trunked cedar tree with a single central main trunk. The highlight of this sight is the unusual straightness of the three trunks as they climb into the sky. Virtually unknown to tourists, Nakaoatsuta Shrine was recommended to us by the locals. If you are looking for a place to refresh your spirits, this brilliant green moss covered shrine is ideal; to both the left and right of the stone torii you will find clear spring waters burbling forth. Horaiyoshimi Shrine is known to the locals as Hokonomiya and has two key features that stand out. The first you can see in the photograph right away; standing at the entrance to the shrine are Meotosugi, or a Coupled Cedars, both of which have been standing for roughly 700 years. To see such grand trees standing outside a shrine is a sight almost unheard of in other parts of Japan. The second unusual feature is that the shrine has its own outdoor sumo arena. It is very rare for most people to see a sumo arena, so if you have made the trek to Oguni, it's a good idea to stop by Horaiyoshimi Shrine and check it out. And when visiting the town of Oguni, make sure to stop by and see their fascinating art galleries and history-rich museums. Known as the Grey Painter, and the Silent Man of the Orient, Sakamoto Zenzo was an abstract painter born and raised in Oguni, Kumamoto. The Sakamoto Zenzo Art Gallery is where you will find natural works and items that have come from the town itself, not to mention Japan-specific works of abstract art that have even won critical acclaim overseas. The building of the art gallery itself is quite unique; a private home originally built in 1872 was dismantled and rebuilt here, and is the only fully tatami-matted building of its kind in all of Japan. With wide exhibition rooms, visitors can freely sit on the tatami mats and leisurely appreciate the works on display. The world famous medical scientist, Kitasato Shibasaburo was also born in the town of Oguni, Kumamoto. To preserve the memory of his great achievements, this center, the Kitasato library, visitors hall, familial home and more have been carefully gathered, preserved and put on display here for the public. In the gift shop you can also purchase pins featuring the bust of Kitasato Shibasaburo made from Oguni cedar. Delicious local products, a picturesque sakura tree, massive cedars, a reversed waterfall, unusual shrines and even unique museums - all only found in Oguni, Kumamoto. With not one but two large hot springs to choose from, spending a night or two in Oguni and taking in all that they have to offer is our recommendation; by all means, please visit this charming town in Kumamoto.